Overall approx. size: 36″h x 21″w x 17″d. Synonymous with style, form and functionality, PLATEAU Corporation continues to create the best audio/video/home theater furniture systems. With state-of-the-art design and using only the finest materials, we succeed in bringing to you a unique system that can grow as your system grows. PLATEAU furniture systems are easy to assemble, incredibly durable and are specially designed to your audio/video system. If you believe in only the best for your audio system or home theater, then we believe PLATEAU is the only choice. This Series offers style, form and functionality to any audio/video system. 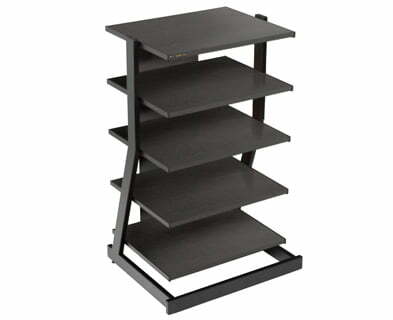 Gently contoured and shaped shelves that are available in a natural Black Oak wood. All models contain a built in wire management system. Heavy gauge 1 1/2″ [ 38mm ] steel posts available in a Black baked powder-coated finish. Assembles in less than 10 minutes. This Series of audio racks contains scratch-resistant shelves with welded heavy gauge steel tube construction to produce a superbly crafted unit. All metal work is covered in a virtually indestructible textured Black, baked powder-coat finish (as are all PLATEAU products). With resonance reducing open architecture, further elimination of resonance and vibration can be achieved by filling the base and side frames with lead shot or sand. This precision piece of technology is designed to stand the test of time. Available in a natural Black Oak wood.